So I did. Several times. I love it and the best part is my kiddos love it. They are getting a giant serving of vegetables without even knowing it. Mama win right there! 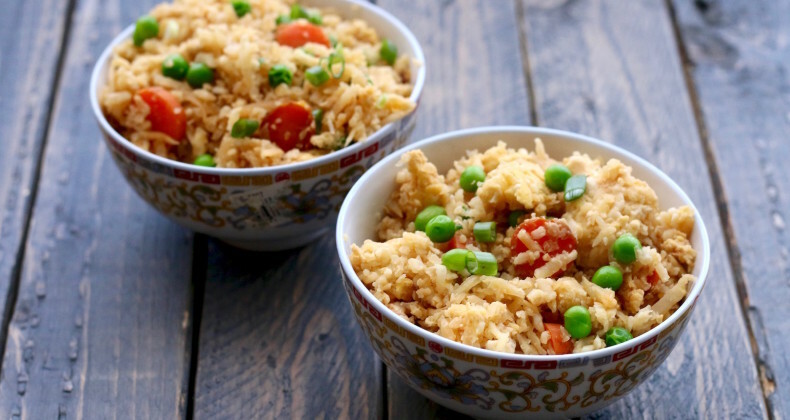 I stuck with the traditional carrots and peas as the other veggies in this fried rice, but if you have a crisper drawer full of sad looking vegetables this fried rice would be the perfect dish to use them up in. While my dish is meat-free you could easily chop up leftover chicken, ham, turkey, shrimp, whatever and add to it. Using my food processor I shredded the entire head of cauliflower in a matter of minutes. A quick toss in the wok over high heat means dinner is served in less than 15 minutes. Eating Cauliflower Fried Rice as leftovers are the bee’s knees. You know how traditional fried rice gets hard and crunchy when it is refrigerated? Not cauliflower fried rice. It stays soft. There have been several days I have eaten it cold for lunch. It is the best! 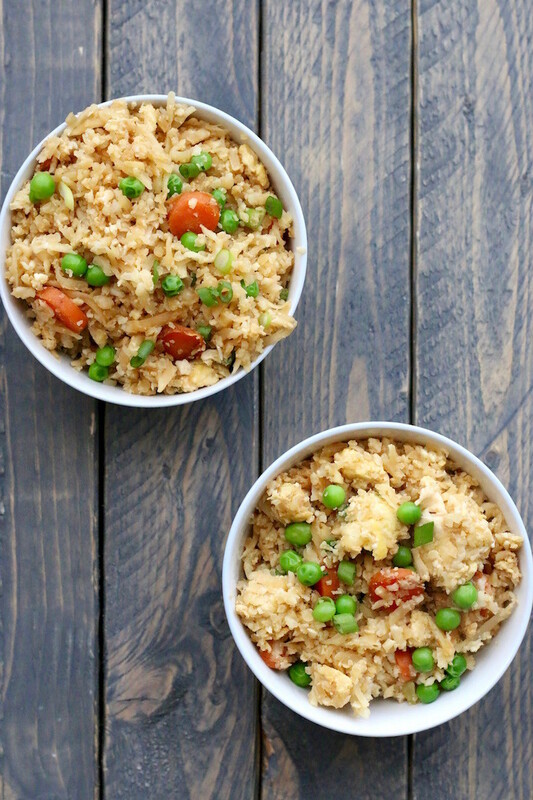 If you pack your lunch to bring to work/school this Cauliflower Fried Rice is going to become your new BFF. No microwave needed! To keep things really easy I like to use pre-minced ginger and garlic you can find in the freezer section. I use Dorot brand. I LOVE fried rice but I haven’t made it myself yet, you’ve inspired me to finally do it! I have yet to make cauliflower rice and I happen to love cauliflower. It’s a blank canvas just waiting to be turned into something delicious! I will have to give your recipe a try! It is a great blank canvas Megan. Totally need to try this – hope it passes my picky eater test, too! I hope it does too! My pickier eater didn’t even know he was eating cauliflower. Very interesting! I will have to try this. We haven’t had pasta or rice for over a year I miss it. We watch carbs very close. This would a great alternative all fresh sounds delicious. Cauliflower is a great rice substitute. I was impressed. This sounds amazing! I’m so going to try it! I like to bake cauliflower in an oven set at 400. I mix olive oil, crushed red pepper, and lemon juice together to drizzle over it first. I bake it until it’s yellowish on top. Sometimes towards the end I’ll sprinkle parmesan cheese, and bake it an extra 7 min. That sounds wonderful Alissa! Roasted cauliflower has a sort of popcorn flavor to me. I love roasted cauliflower with garlic and red pepper flakes. I used to make cauliflower rice all the time, but haven’t in a long time…now I think I need to. I have all the stuff for it–and love that its a great way to use up old veggies!